We are in the month of love, and it is the month much love and affection is expressed the most. It is the month in the year that many people get their romantic self out and spread love like never before. Early this month, award-winning comedian Lekzy DeComic, has proposed to his colleague Jacinta. The proposal came during the end of his show, laughline. Lekzy went on his knees to present to the comedienne a bracelet made a fan of Gh Comedy. On the night, the fan presented bracelets to every comedian present to show appreciation and support for the budding industry. 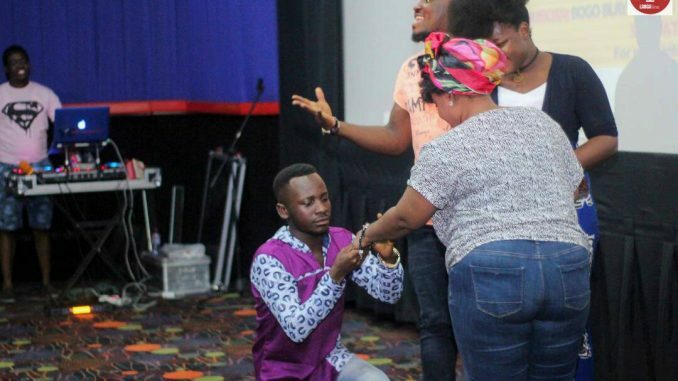 As she [The Fan] was about presenting to the female comedienne, Lekzy used that opportunity to go down on his knees and present the bracelet to Jacinta. Come and watch both of them perform next month at Laughline on March 3. Venue is the Global Cinemas Weija. Tickets is going for a cool 30cedis. Come and enjoy yourself with a good laugh, who knows both may announce the date for their wedding.